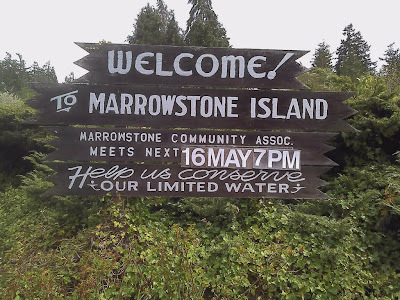 I added "WWW.MARROWSTONE.INFO" to the Marrowstone Island Welcome sign on 4/27/2011. Below is a chronology of events leading to that moment. 1999 - I started the Island Net on Yahoo Groups. 2003 - 2010 - I played with various platforms for a website about MI. November 2010 - I discovered Google Sites and started building this website. 2/13/2011 - I posted this note to the Island Net describing a sign that contained a very cryptic URL created using Google's Short Url. It was a fiasco. I took the next six (6) weeks to do it right. 4/6/2011 10 AM - I presented a proposal (see below) to the Nordland Garden Club Board and around 10:20 AM, the Board unanimously approved a motion to add the link "WWW.MARROWSTONE.INFO" to the Welcome sign. 4/20 - I presented the same proposal to the MICA Board and they unanimously approved a motion to add the link "WWW.MARROWSTONE.INFO" to the Welcome sign. My presentation to both Boards proposed adding a fifth board in the middle. I said I would do my best to make that sign board look like it was part of the original sign. Both Boards authorized the MI Sign Advisory Group (made up of Joan Anliker, Ralph Rush an Pete Hubbard) to use their discretion on how the link would be added and what it would look like. 4/21 1 PM - I posted this note to the Island Net informing subscribers about this decision. 4/22 The MI Sign Advisory Group approves the "weathering" of the board and the stenciling I will do. 4/27 1:15 PM The new sign has been installed. 8/28/11 - Added holder on far right to hold filenames for web pages like "/island-net"
Approx. Feb. 2012, the Nordland Garden Club Board asked me to me the added holder, and I did. The award is presented to someone who “... has (had a) widespread and long lasting effect on Marrowstone Island and/or Jefferson County.”. I do not consider my “effect” to be that “widespread” because at this moment there are only 245 subscribers to the Island Net and that is less than 30% of the Island’s population of 837. I want everyone on the Island (who has access to the Internet) to be subscribed to the Island Net so neighbors can help neighbors day-to-day, or when an emergency happens. I am often asked “How can we get more Islanders to join and use the Island Net?”. Currently, the only way that Islanders learn about the Island Net (and the Island websites) is by word of mouth from neighbors and friends. I’m here today to ask your permission to offer Marrowstone Island another way. The MI Welcome sign in the triangle contains four (4) boards. I wish to propose the addition of a fifth board in the middle under the second board that says “To MARROWSTONE ISLAND”. Before I go any further, I want you to know how proud I am of the work some of your members have done and continue to do to maintain the triangle area. I’m sure other Islanders, visitors, and the county are also proud of your work. I will do nothing to detract from that. I will do my best to make the fifth board look as authentic as the other four. My goal is make the fifth board board look like it was part of the original sign. To insure this, I would like to ask a small group of Islanders (mostly Garden Club members) to offer advice and approve of the size, shape, and color of the sign. We might call them the “MI Info Sign advisory group”. 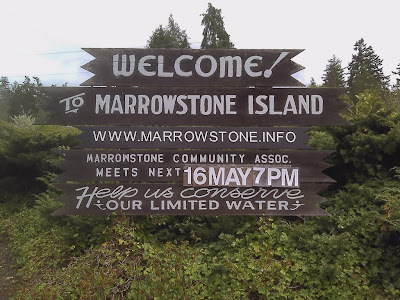 The sign will simply say “WWW.MARROWSTONE.INFO”. That is the link to the MI Information portal website which contains links to other MI websites like the Island Net, the Hellow Pages, Emergency Preparedness and other web spaces that have yet to be developed. Once the sign is approved by you, the MICA board and the MI Info Sign advisory group, I will move the top two (2) boards up high enough to fit the new board underneath. If it doesn’t work out, this can easily be reversed. My work effort on this sign and the websites has three (3) audiences. WA State DOT defers to Jefferson County for management of the triangle area who in turn defer to the Nordland Garden Club and MICA. The Jefferson County planning department says that no permit is required to modify the sign. I hope you will approve this proposal. Thank you for your time and consideration.